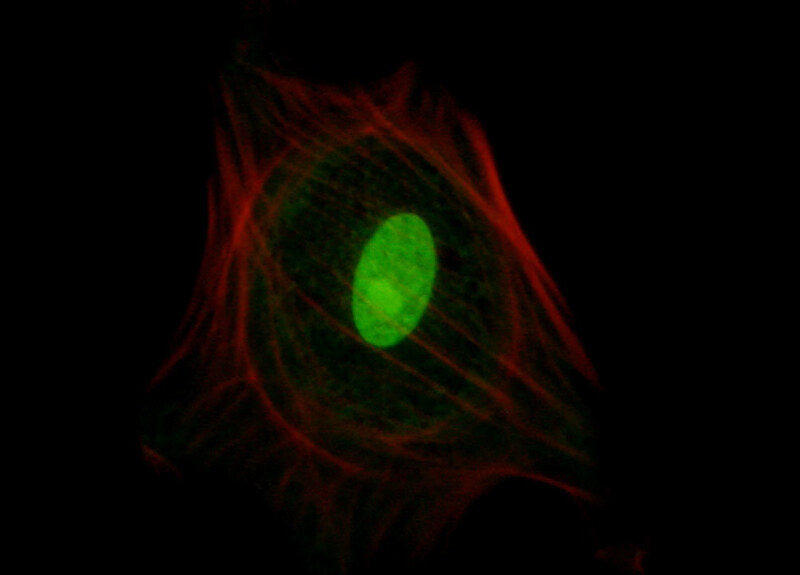 Fluorescence emission intensity from a culture of Indian Muntjac cells that were labeled with SYTOX Green to stain chromatin in the nuclei. The visible light absorption maximum of SYTOX Green is 504 nanometers and the emission maximum occurs at 523 nanometers. In addition, the specimen was simultaneously labeled with primary anti-human OxPhos Complex V inhibitor protein mouse monoclonal antibodies followed by goat anti-mouse Fabfragments conjugated to Pacific Blue (absorption maximum at 410 nanometers). The actin cytoskeletal network was also labeled with phalloidin conjugated to Alexa Fluor 568. Note the presence of weak signal levels from the red (Alexa Fluor 568) fluorophore, but the absence of fluorescence emission intensity from Pacific Blue, which is not efficiently excited in this spectral region.